Lately I have been wanting to withdraw a bit. 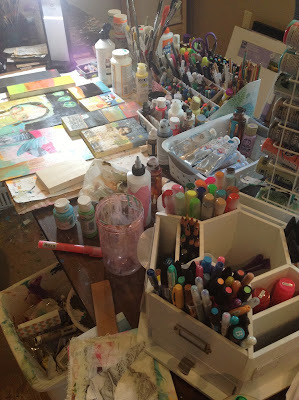 I don't want to admit to anyone that the fear of my love for painting is waning. I'm hoping its one of those dark spells again that surface every now and again. I have been through this so many times, yet each time it feels different. Each time I feel raw and exposed and want to hide away from all social media. But there are definitely some pros for social media. oh yes. The other day while I was thumbing through the newsfeed I saw this quote. I have been hearing this same voice. I go to paint. I sit. I am disturbed and disgusted at what is coming out of the end of my brush. I guess what I'm saying is that I always want this to be a joyful process. To be happy while I'm doing it. And yes, most of the time I am. Apparently, like the rest of life it doesn't always work this way. I have decided to see this as a gift. A sometimes wrenching process that must be this way to build within it's own character. This process is alive. This process is a voice that's sometimes weak. It's not always "sure of itself". It has a dynamic that artists' have been trying to wrap their brains around since the beginning of time. Who am I to say I've got it figured out? Who am I to say I ever will? All I can do is continue to paint. Continue to silence the dreadful voice. This process is an extension of my soul. Something I put into God's hands. God is the magician. We are the magic. Oh, how absolutely comforting to read that artists like you go through the same doubts als little oll' me! Thank you for sharing. I've been struggling myself. I can't imagine you struggling because when I watch your videos for True Free Spirit you just seem to paint so quickly and freely! But I'm sure it happens to everyone. I'm struggling with: do I paint freely and loosely, or do I paint with something in mind first? Do I try to share my big abstract paintings with the world when that's not typically what I share? Thanks for being an inspiration in all your works! Oh my gosh!!!!! That was the most beautiful thing i've read in a long time, it's also how i've been feeling about my art work, i haven't been happy with anything i create. Well said! :-) The best thing to do is chat with Him! I recognize the 'voices' part, but in Him we are bigger than our fears or doubts, in Him we are free. I'll pray He will bless you with overwhelming joy and freedom to create in honor of His name. God bless you! before i read your post I thought what a gorgeous painting of the little house in the night. Then I read what I often feel. We are our own worst critics and like the old saying goes...you have to have the good with the bad and without the bad days we may never appreciate the truly great days. I look at your table of works in progress and I see a creative soul! Take a break, lie in the sun, breathe in the fresh air...scream loudly to no one in particular if you need to...you have a beautiful gift so please don't stop sharing! GREAT post!!!! I love your raw honesty!! My gorgeous Mindy, thank you for sharing your inner struggles and letting us see that we are all human no matter what stage of the game we are in. You are a doll!! Sounds like you are on the verge of a break through. Be patient and kind to yourself and ride the wave! What a beautiful post, Mindy. I totally understand where you are coming from. I go through this every few months. I went through this after MATS. Something that helped pull me out of rut was playing with a different medium. I have a million art supplies and sometimes they get lonely and need to be played with. Your art is so beautiful. Create something! Whatever you want for you! Love you, friend! I recently discovered the author Eric Maisel and have been reading his book 'Van Gogh Blues' about dealing with depression when you are a creative person. It has been helpful to me and I am finding his book about creative anxiety even better. I wish you all the best. oh girl. if you haven't yet, pick up a copy of art and fear. even if you've read it, perhaps read it again or pick it up and flip through it and see where it lands. 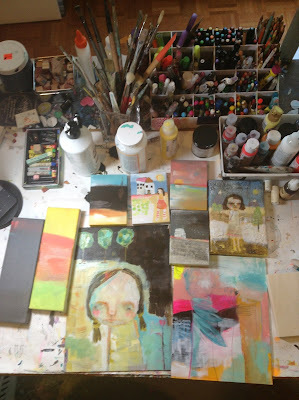 i have a studio full of four dozen WIPs or complete works. it's the result of pushing through the last year, of the ups and the downs, but not having much motivation to finish things and see them through and list them and get them out there. ha, that's a different problem, entirely, though. if you need to take a few weeks off. a few months. whatever it is, your love for painting isn't gone, just changing, allow it to be. We all need a break, Mindy...and you're no exception. Maybe you've taken on too much. Unless you're committed...be kind to yourself. It's okay...we're not going anywhere. Thanks for sharing Mindy...I so often feel the same thing. So comforting to know somebody as talented as you has to sometimes have that battle with the brush. Nowhere in Van Gogh's quote does he say it is going to be easy. If it was, there would be painters everywhere we look. He said the voice (s) would be silenced, but he did not say how long it would take. I stopped blogging 5 months ago in exchange for (hopefully) truer painting - painting for myself. 5 months and 40 or so new paintings and that voice is still languishing about. This is a tough path we chose. Thank you for sharing your fears and making us feel we are not alone in our struggles. 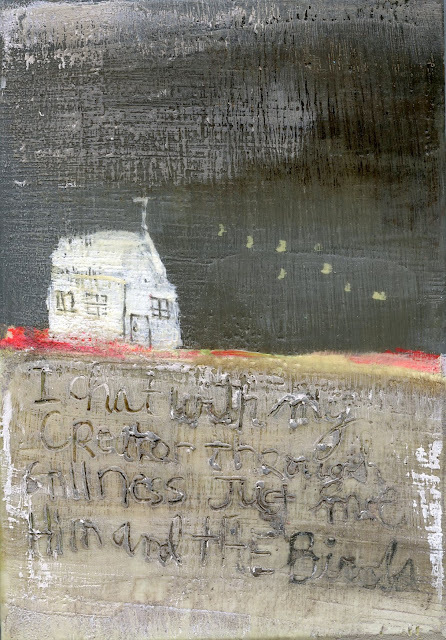 Your painting of the house in the dark of night is glorious.